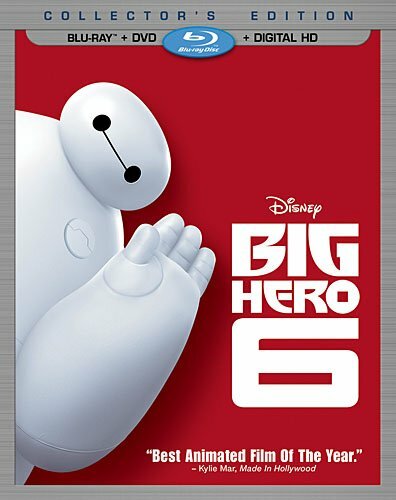 Big Hero 6 won Best Animated Feature at the Academy Awards. While I enjoyed the movie, I didn't enjoy it that much. I thought The Lego Movie, How to Train Your Dragon 2, and The Tale of the Princess Kaguya were all better than Big Hero 6. Big Hero 6 had some comedy, and some touching emotional moments, but it also took a while to get to the main plot and a lot of action would go from exciting to boring. Hiro Hamada is the protagonist and is a boy genius when it comes to robotics. His older brother tries to get him out of the illegal robot fighting world and into a university where he can put his skills to good use. So Hiro is impressed by the university and its head honcho, Professor Callaghan and dedicates himself to coming up with an invention that will get him in. What he comes up with is a ton of tiny robots called microbots which all work together to become anything a person can imagine, literally, as they're controlled with a neural transmitter. This invention is clearly one of the best inventions in the history of the world. I could change the world in ways we couldn't even imagine. But something happens at the expo where Hiro is demonstrating his microbots which causes a fire to break out. His microbots are assumed destroyed, and his brother and Profession Callaghan are killed. Hiro falls into a depressions, of course, but then discovers his brother's last invention, and balloon-ish robot named Baymax that was designed to help people. He also discovers a microbot that is trying to get back to his buddies, which Hiro assumed were destroyed, so he and Baymax follow it and discover a crazy guy in a kabuki mask. Some of Hiros friends join in later and they all try to figure out what the bad guy is up to. It just seems like a strange plot. It starts with a super smart kid trying to get out of what will be a bad life, and then after a short time he does so that part of the plot is over. Then it becomes a story about the kid's super awesome amazing best invention ever which will completely flip the world on it's head. And that story ends after a short time and it becomes a story about a kid dealing with the loss of his big brother. After another short time he seems to get over that as he makes friends with his big brother's invention. Then his finding friendship lasts for a short time until the plot transforms into a mystery of some evil guy in a mask. It goes from robot fighting to inventing to an emotional death scene to finding a friend to tracking down an evil madman and finding out what he's up to. I wasn't a huge fan of the story but I did like the relationship between Hiro and Baymax, and I liked when the friends came in but I think they could have come in sooner. The action got dull pretty quick, especially near the end. The comedy that was there did work, and the emotional scenes did too but there wasn't a whole lot of those. I enjoyed it but don't have much of a desire to watch it again and don't understand why it won Best Animated Feature. There are some extra features included and they're all pretty nice. There are deleted and alternate scenes, a couple of behind-the-scenes featurettes, and a short called Feast which is definitely worth seeing.